Renderings of the proposed 2017 Cross Bayou development. 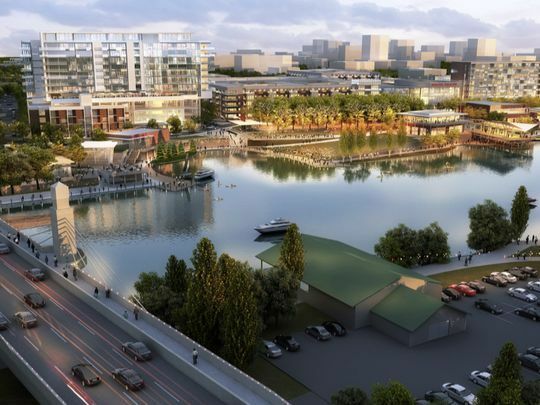 The redevelopment for Shreveport’s Cross Bayou isn’t off the table just yet. Five months after a plan by Mayor Ollie Tyler to see a sports arena and mixed use development just off downtown Shreveport was not pursued by the city council, a 10-year, $1 billion development of Cross Bayou and Ledbetter Heights has been proposed. Called “Cross Bayou Point,” the development would see a sports complex, municipal complex to replace the aging state building on Fairfield Avenue, a technology-based charter school and a 5,000-unit, mixed-use housing development. Headed up by a group of local principals calling themselves Gateway Downtown Consortium, a news release issued Wednesday said it is seeking to attract a G-League affiliate of the New Orleans Pelicans NBA team, just as Tyler’s proposal did. Tyler proposed using $30 million of the city’s riverfront development fund to build a 3,500-seat sports complex, anchored by the Pelicans affiliate. The plan required $100 million private investment from Corporate Realty, an Alabama-based real estate company, for the remainder of the development. According to the release, the project’s leaders are Paul Pratt, director of government relations for Chesapeake Energy; Rev. Theron Jackson, pastor of Morning Star Missionary Baptist Church and a former Shreveport City Council member; and Curtis Joseph, a lawyer. That group’s principals have partnered infrastructure developer AirRail and real estate developer Janus Property, both of New York City. “There have been decades of discussions and numerous plans to develop the Cross Bayou waterfront, but I always believed the initiative had to begin in the private-sector and would need to stand on its own without the bells and whistles, usually associated with attracting tourists,” Pratt says in the news release.